You’ve spent all that time writing your screenplay. Do you really need to spend even more time adapting it into another form? Terry Rossio thinks you should and here’s why. “In today’s world, IP is everything. The ultimate path to power in Hollywood is to own intellectual property. Consider J.K. Rowling. If she had written the screenplay version of Harry Potter, if it garnered any interest at all, she would have been forced to sign over ownership to some corporation, for a low fee. Instead, she wrote the novels, gained worldwide following, kept control of her IP and reaped hundreds of millions. Unfortunately for screenwriters, the IP path is only available if you first work in another field, such as plays, novels, comic strips, short stories, or graphic novels, and to some degree series television. Consider writing your screen story as a YA novel, and then optioning the screen rights. Retain the sequel rights; if the project falls apart, it’s not dead, you option the property again. If the film got made poorly, you could authorize a remake after a few years, or even sell the property into a variety of mediums. Note that the IP you create doesn’t have to be a novel. Perhaps your story lends itself to something shorter — a graphic novel, web comic, or short story. IP in these forms have been the source material for some great movies, so it seems to follow that they’re options worth considering converting your story into. This is related to the first point, but different. As Terry noted in the quote above, IP is everything. But where the first point is about owning your IP in order to get the most out of the time you invested in creating it and to ensure yourself the best monetary payoff, here I’m talking about creating IP as a marketing strategy. IP is everything, and its existence can give your project an advantage. There are entire companies built on this idea, like Adaptive Studios. Their strategy involves mining studios’ Dead Projects piles for screenplays with promising concepts, turning those screenplays into novels, and then selling the IP for TV and movie adaptation (or producing the projects themselves). They use the books to promote the films, which in turn will also help book sales. The novels are an inexpensive testing-ground for concept marketability, and a way to build audience for potential franchises. Writers can do this on their own, too. Screenwriter Lisa Joy turned her coming-of-age fantasy drama into a graphic novel called Headache — which she funded herself — and then optioned it to Fox, where she has been developing it as a TV series. Having your story exist as IP in other forms can make it more desirable. It can also expand the opportunities for it to get noticed. You could publish a short story, or enter it into contests. You could publish a graphic novel digitally to lower some of your up-front costs, then share it on social media. You could turn your screenplay into audio-based drama and turn it into a podcast. If you’ve written a few screenplays, you’ve probably started to get a grip on what you can do — what comes most easily to you as a writer. It’s great to know what you can do, but that doesn’t mean you should flex only those muscles. Venturing into new forms can help you expand your skill set, test out new techniques, and explore style and voice in your writing. The exercise of shaping and re-shaping a story helps you internalize structure and strengthens your storytelling ability. You’ll gain a deeper understanding of how the parts of a story work, individually and together, and when and why to deploy the elements you have at your disposal. 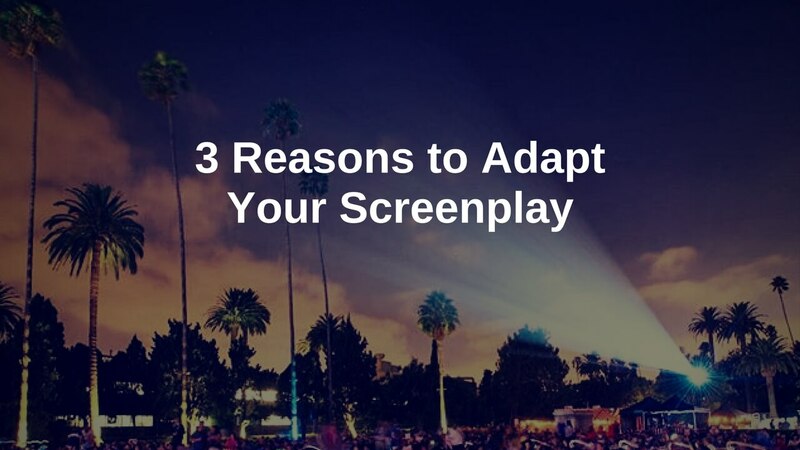 Adapting a screenplay into a different form may also give you a new understanding of how to reverse the direction. Helpful if you plan to adapt IP into a screenplay in the future. Making a new version of your story may also challenge you to create more well-developed and interesting characters. Forms that are written to be consumed on the page – short stories, novellas, novels, even graphic novels — invite more internal exploration than screenplays, which are really intended to be consumed as movies, a visual medium. Fair warning: this will probably make the process of creating feel harder. Maybe even less (or zero) fun – at first. But that’s the nature of growth. It hurts, and then you reach a point where you kind of get a feel for the new tool or skill, and you can find the fun (or at least the sense of accomplishment) in it again. And to my mind, learning and growing and improving are never bad things. Well, I’m jumping on the bandwagon. National Novel Writing Month — NaNoWriMo — is just around the corner, so a lot of people are talking about writing novels in November. You know I love a good 30-day sprint for creating focus and making real progress on one writing goal. So why not use the energy of NaNoWriMo to set a November goal for yourself? You certainly don’t have to write a novel. Make your own rules. 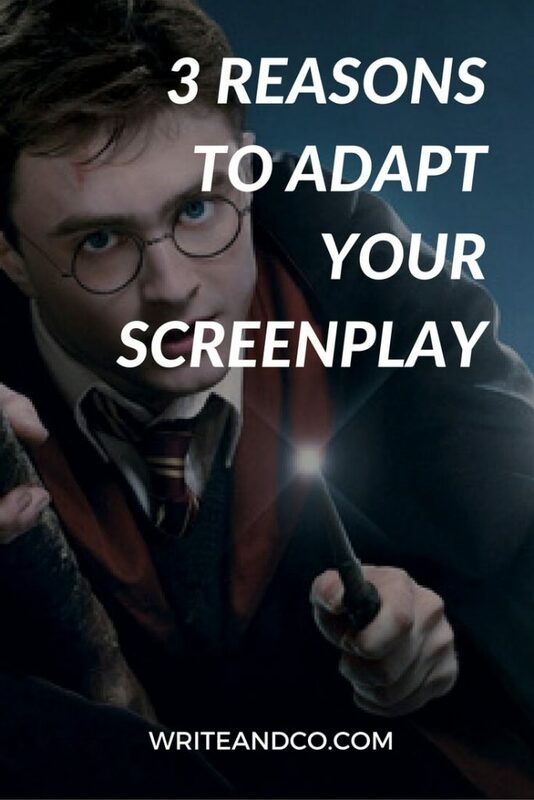 Adapt your screenplay into a novella. You could end up with something really great – IP you own, that maybe even helps your project get traction. It legitimately depends on whether or not their background was originally literary in the first place, for I spot-checked the curriculum at USC Film School and they don’t offer any lit or writing classes beyond straight screenwriting. I’ve adapted books I’ve written into screenplays and vice versa and found that you have to severely pad out a screenplay into a book. Hi Jeff! Thanks so much for your comment. I agree that there’s a lot of additional work to be done to turn a screenplay into a novel (or to adapt anything into any other format, really). The post wasn’t meant to imply that the process was easy, or that film school prepares a person to do so. But it’s always nice to know what options are available so they can be considered with regard to one’s individual set of circumstances. Cheers!